Caution: This week’s SoTW may contain content unsuitable for minors and some adults. Before Franz Schubert died in 1828 at the age of 31, Pfennigless and a commercial flop, he had composed 600 Lieder (romantic art songs), nine symphonies, and a whole pile of chamber and solo piano music. His greatest hits include the Marche Militaire for a 4-handed pianist; the “Unfinished” Symphony; the “Trout” string quintet; “Ave Maria” (which started out as a translation of Sir Walter Scott’s poem ‘Lady of the Lake’ beginning with an ‘Ave Maria’ greeting–an 1820 ‘Yo Bro’ – but the text of the entire Latin prayer somehow stuck to the melody); and one of my personal favorites, the String Quintet in C Major. But for our Song of The Week (okay, it’s not a song – sue me) we’ve chosen his hands-down #1 smash hit on the Classical Horror Music chart – “Death and the Maiden” (“Der Tod und das Mädchen”). Seven years later, acutely aware of his impending death and tortured by his failure to achieve recognition as a composer, he used the theme of the lied as the basis for the second movement (Andante con moto) of the String Quartet No. 14 in D minor, also named “Death and the Maiden”. 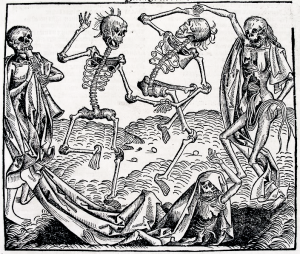 The motif first appeared in Medieval art as the “Dance of Death” (Danse Macabre), an allegory on the universality of death: no matter one’s station in life, the Dance of Death unites all. 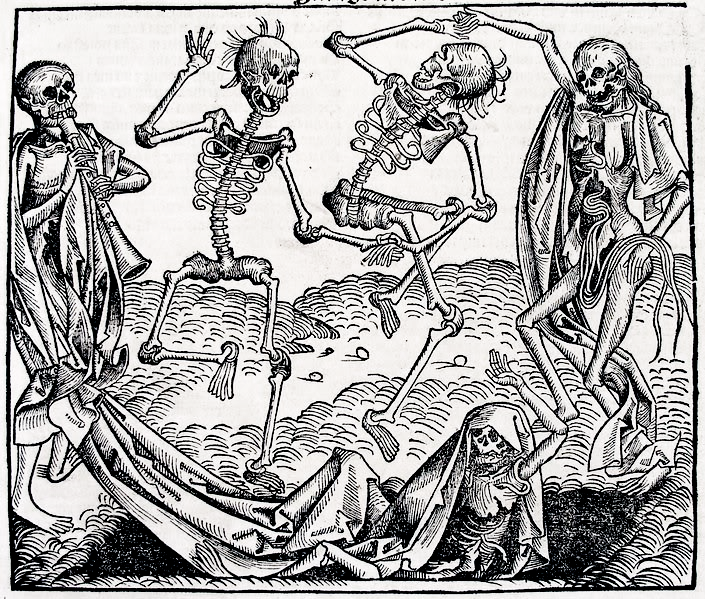 The Danse Macabre consists of personified Death leading representatives from all walks of life (typically a pope, an emperor, a king, a child, and a laborer) to dance along to the grave. These paintings were intended to remind people of the fragility of their lives and how vain were the glories of earthly life. The Renaissance artists may have been attracted to the virgin as the epitome of vitality, contrasting most sharply with skeletal death. Or, according to scholars more learned than I, they may have used her as an excuse to portray a naked woman. Kind of like slasher movies today, I guess. In 1517, Hans Baldung Grien painted this painting in which Death seizes a girl by the hair and forces her to go down in to the tomb dug at her feet. Death indicates with its right hand the grave. The girl, completely naked, does not try to resist. Her mouth is plaintive, her eyes are red and tears run down on her cheeks; but she understands this is the end. Here’s a fascinating article on the subject. Well, he was no virgin – he was dying of advanced syphilis. But he certainly knew something about Death. 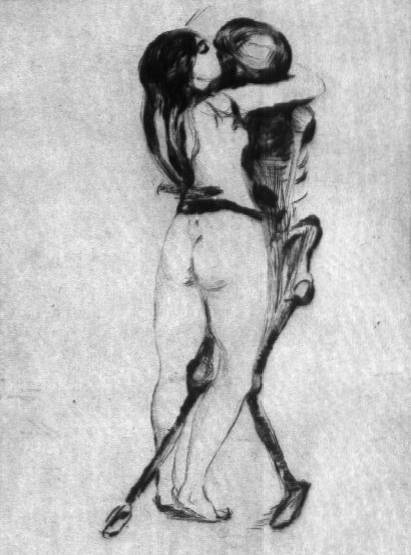 His “Der Tod und das Mädchen” is a harrowing expression of the spectre of his imminent end; in the words of critic Andrew Clements, “its bleak vision and almost unremitting foreboding”. It’s some of the most dramatic music I know, hyper-energetic throughout, an astounding amount of music for sixteen strings played by sixteen fingers (well, seventeen if you count the cellist’s thumb). There’s a notable lack of solo voices throughout–more often two pairs playing in tandem. 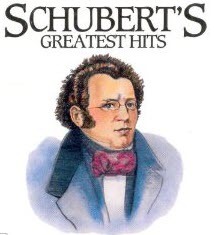 Schubert’s one accomplishment during his lifetime was to inspire devotion from a close circle of supporters. In life, as the maiden so painfully learns, you go to the grave alone. But harmony, as this quartet shows so memorably, is made with the help of your friends. Best yet. Really learned a lot from this week’s SoTW. A lovely piece, quite melodic and soothing – if one didn’t know the topic. A very interesting sotw – Thanks Jeff! 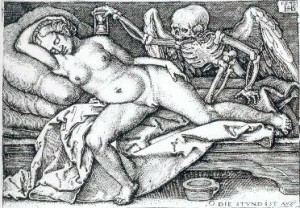 (Death and the Maiden (1994) – http://www.imdb.com/title/tt0109579/ ) – very good movie, but very difficult to watch …. I saw the play on stage once upon a time. Indeed, a hard one to take. Thanks for the comment. Always very good to hear from you. Thank you for including the Edvard Munch artwork, it has always fascinated me.